Roasted, the venue for the second of the St Clair River Fall Color Tour has closed. We are attempting to find an alternate venue (possibly the one in St Clair with whom we've been unable to make contact) but might end up being forced to cancel that middle event. Please watch the cache page for more information. I submitted the first three events in the St Clair River Coffee Crawl/Fall Color Caching series today. We have one more event we're working to include but have not received permission from the management. That event is included in the events list on the MCCM page and we hope to have it included within a couple of weeks. Watch for more information and those caches to be published soon. On New Years Day, January 1, 2011, our good friend gsix5666 will be hosting his second annual New Year's Day Meet & Eat event in the city of Roseville. This years venue for the event has been moved to the lower auditorium at Sacred Heart Church on Gratiot Avenue and Utica Road. The event will feature a pancake breakfast available for purchase from the Knights of Columbus as well as the usual geocaching event fare (TB's, coins, sig items, FTF raffle, etc.). Please come out and enjoy what is sure to be an excellent day of fun and geocaching goodness! Work has begun and the venue reserved for Cachercon 2010 Metro Detroit. Hold the date in your calendars -- February 6, 2010 should be a fun and educational event! The event has been submitted to Geocaching.com and hopefully will be accepted shortly. In the meantime planning continues and we'll post updates on the Cachercon 2010 Metro Detroit page here. I approved the proof for the tiny little MCCM coins this evening. I should be receiving them before long and I'll pass out a few to each team and we'll drop them into caches we hit as a group. These tiny little guys are black nickel and completely free from any tracking or trading numbers. We hit our 2,500th cache find on Saturday at the Burton Veteran Memorial (GC9875) virtual cache during a swing across the tip of the thumb. We started the day with 2,499 finds, found 46 caches during the 14 hour trip for a total at the end of the day of 2,545. We're looking forward to hitting the 3,000 soon, and ItsNotAboutTheNumber.com is calling for that milestone to fall by the end of this summer if we keep up our current pace. It's very possible -- we're only 186 finds from hitting our total for 2008, and 277 from our all-time best of 801 in 2007. I'd like to have at least one calendar year where we would break 1,000 finds. That's only 476 more finds for the year. Perhaps we can pull it off in 2009. The "MCCM" Stamps Have Arrived! The tiny little rubber stamps for Motor City Cache Machine have arrived! I'm very excited as they turned out quite well. They're small as can be while still very legible. These are all exactly the same, all in blue ink. While not as portable at the folding ones we used earlier, these are a little harder for Bill and Drie to ink themselves. I have one for each team currently caching with under the MCCM name ready and waiting. Make sure to bug me to get yours. 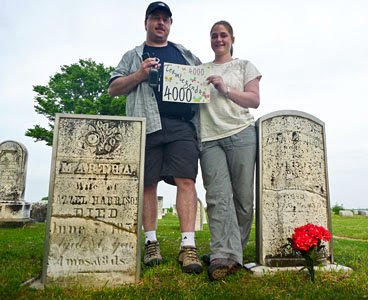 While out for our trip to the Southern Counties this last Sunday, TeamLegend4 found their 4,000 cache. Congrats TL4 -- looking forward to 5,000 shortly. I have ordered the small, round rubber stamps of the MCCM logo in blue ink. These will be tiny (only a half-inch at its widest) and there was no room for additional text. Once they arrive I'll start passing them out.